Oooooh I just finished it. Oh yes. I have goosebumps. *shivers* LOL!!!!! Oh how it caught me in its web and spun itself around me. Look at that cover. Doesn’t it just haunt you? The story will, too. And thanks to a few of my thrill-seeking book-buds, this one came highly recommended and was everything I imagined it would be. “Someone needs to read this book ASAP. (Amy, Maryse a I know you two will love this one!) SO, so good and completely pucked up. The writing was exceptional. The characters voices on point, the story will keep you on the edge of your seat, and your emotions will be put through the ringer. I couldn’t put it down, but I couldn’t handle reading straight through either. I wanted someone to hold my hand for sure, and I don’t think I’ve ever felt that way about a book before. It’s why I don’t watch scary movies anymore, it jacks my anxiety through the roof. Don’t read reviews, I did read the blurb and that was just enough, but don’t spoil it for yourself. Maryse: YOU GUYS!!!! 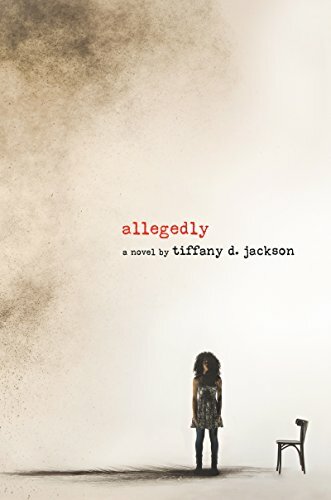 One of Tasha’s favorites from her best of 2017 list (“Allegedly”) is super-bargain priced right now. I posted it up and I’ve been DYING to read it. I one-clicked it SO HARD!!!! YAY!!!!!! !!!! AMY!!!!!!! AMMMMMMMYYYYYY!!! R!!! ELA!!! NAY!!! KOOLOOOOOO!!! EVERYONEEEEE that likes crazy stories. Let’s read it. I’m starting tomorrow evening!!! Something gave me chills ( I won’t tell you what!! ), and oh…. how I love when that happens. Oooohhhhh yes. There’s SO much I want to say but I can’t. There’s so much to explore here, realities of life, past and present, and yet…. those are the discussions for a book club. How PERFECT is this book for a book club read? Mary is in a group home for girls that have been convicted of some pretty severe crimes. They’ve done their “time” as children, and are officially “released” but since they’re still minors, they are still in “the system”. It took the state six long years to realize I wasn’t a threat to society before they ripped me out of baby jail and put me with Ms. Stein. From one prison to another, that’s all it was. Understand, there’s a big difference between baby jail and juvie, where the rest of the girls in the house come from. Juvie is for badass kids who do stuff like rob bodegas, steal cars, maybe stupidly try to kill someone. Baby jail is for kids who’ve done way worse, like me. And how terrifying it is. Guess birthdays don’t mean nothing in a group home. I mean, it kind of makes sense. Hard to celebrate the day you were born when everybody seems to wish you were never born at all. Especially after you come into this world and f**k it all up. She’s essentially living in a home with potentially dangerous criminals. Some, extreme psychopaths that have gone as far as attempting to murder their own parents. I don’t talk to anyone. Talk gets you into trouble and these girls are looking for trigger words to be set off. As far as everyone is concerned, I’m a mute. And Mary is living in constant terror and drama for her own life, and her desperation to be free and to finally live her life. And free of her mother. Yet… she’s considered the most psychotic of them all. After all, she killed a baby, when she was just a baby herself. Most of the crimes the other girls in the house committed are like that. Crimes of passion, “snapped” moments, and good ole-fashioned wrong place–wrong time situations. My crime was more psychotic. I was the nine-year-old who killed a baby. Allegedly. That’s the word they always used. Oh yes. She was only 9 years old when an infant was killed in her proximity and all evidence points to her. But Mary won’t speak. She knows that the only way to keep herself safe is to keep all of her secrets and truth guarded. Every horrifying moment from her childhood, locked up deep inside. Momma’s not a monster like that. She just doesn’t know what she’s doing sometimes. At least that’s what I’d like to believe. Including what she knows of the baby she adored with her whole heart. But circumstances change, things become dire, and force her to seek help for her future. And that’s when she finally starts finally speaking… and her whole world changes. Not everything is at it seems. WOW!!! It’s a psych-thriller, but there’s a whole load of meaning, purpose and pain underneath it all. And real life. And the consequences of certain versions of real life. Of expectations, whether they be realistic or not. And then there’s the whole guessing game throughout. Not an all-out guessing game, as the reader truly connects with the main character in this one and has a good idea of what’s happened… and what’s going on. She makes us understand. She has us living in her past… in her nightmares, in her present circumstances and the unfairness of it all. A knife cuts me open from my heart down to my belly button. I’m bleeding to death and no one can see. But there’s always that level of “what if…?” lurking. Wondering what we’re missing. What we haven’t found out yet. What the potential true reveal will be…. you have NO idea how this one will end, if the truth will ever be brought to light, and what consequences will be faced. Or is it exactly as we understand it to be? Is the reveal and twist going to be something else entirely? Oh my… my friends. This one is FULLY loaded. I’m a little bit traumatized right now by the whole thing. But that ending struck me deep. And I wish to discuss it. LOL!!! I love when a book does that. and it lingers even when you want to forget! GAH!! And I can’t say a word. 😛 LOL!!!! That’s exactly how I felt, so glad you loved it too! I wanted to talk to someone about it for the longest time, but going in blind gives you so much more oomph! That ending can still be interpreted many different ways ya know?